Brittlynn woke up from her nap at nurse at 3 and Kye never did sleep so we just let him get up then too. We got all ready and drove down to Old Town! At 3:30 in the afternoon. In July. It was HOT. Prior to coming on the trip we wrote out everything we wanted to do while in St Augustine then wrote out the kids schedule and filled in the empty spaces with the activities we wanted to do. I’m SO glad we decided to do that. It made the whole trip run so smoothly because we already knew what we were doing when 🙂 You know me, I love some plans 😉 We planned to eat our traditional pizza dinner at Pizzalley’s but figured we’d walk around Old Town for a bit first. We lucked out and found parking at Pizzalley’s! Brittlynn’s first time sitting in a stroller like a big girl!!! If you don’t own a clip on stroller fan…they are the best invention ever. This is the one we own! She seems too little to be sitting up like that!!! First year he can sit on it all on his own!!! 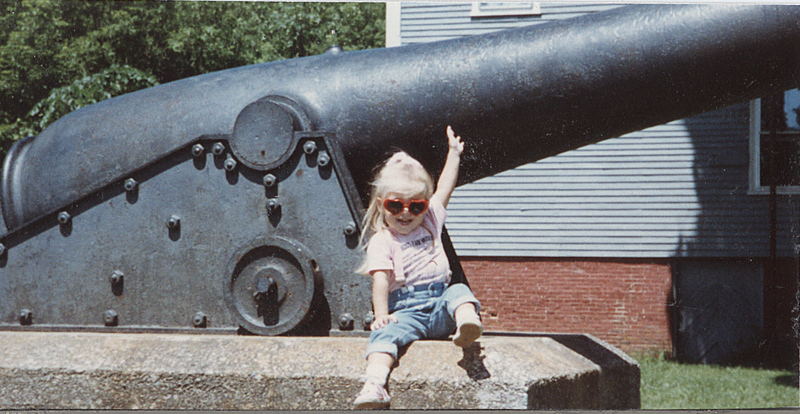 A couple of my old Bowdoinham cannon shots! If you crave a LOT of attention from random strangers then I highly recommend investing in the stroller fans. I mean we like our fair share of attention, don’t get me wrong, but it was even a bit much for US. Literally EVERY SINGLE PERSON would comment on the fans when they saw us. While we walked around we also stopped in to watch a magic show. The magic shop is Zach’s favorite store haha. Like he even owns a couple of the magic tricks they sell there! It was a little over Kye’s head so he got bored pretty quickly but it’s one of those situations where you feel bad dipping out. Especially when we were a pretty large clan to try to be sneaky! We made it through though and headed over for dinner. Kye tried to cheer her up! I felt rrrealllly embarrassed at Brittlynn’s behavior. I hate that feeling. She was crying and I felt like she was ruining everyone’s meals. But what could I do? Gah I wish that child would take a paci sometimes!!! I ended up bouncing her around and trying to keep her happy by walking around the restaurant. Of course she just kept crying so instead of just ruining the people’s meals around us I let her affect everyone elses meals in the place haha. Thank the lord for the food!!! Britt was much happier when we started giving her some stuff to eat! We survived Britt’s first Pizzalley’s experience! Yes, Kye also had to have his bread with him. No joke when it was time to go Kye was more concerned about his piece of bread than his ice cream. My kid loves him some carbs! I promise I did NO flirting or anything…but for some reason the guy behind the counter hooked me up maaaaaajjjor time with the ice cream. So much that it literally couldn’t fit in the cone. His boss even got him in trouble about it! It was sweet of him (or stupid depending on how you look at it) but it was SO much that I couldn’t even really enjoy it. I threw probably 80% of it in the trash! Poor Brittlynn wanted some too…I’m a cool mom but not that cool. She enjoyed some toys instead! Previous Post Britt’s First Beach Outing Redo! We walked around Old Town for a little bit looking for an ornament for our Christmas tree and a t-shirt for Kye. We found a t-shirt and the place was awesome by ironing on the year for us too so we’ll remember which trip he got it from! Didn’t have much luck with the ornament though and decided to take a break for dinner. We wanted to eat early to beat the crowds and so we could save room for ice cream. Our FAVORITE restaurant in St. Augustine is Pizzalley’s. We’ve eaten there every time we visit (including last year!) and if you’ve never been you MUST go! While I LOVE the food there, I just wasn’t feeling it for some reason? I think I was still full from Subway at lunch and I’m trying very hard to listen to my body when I eat. If I’m not hungry, then don’t eat. So I only ate half a piece! Zach didn’t mind finishing off the left overs for lunch over the next couple of days though. (thanks to Robyn for the idea!) It was such a hit too…people kept commenting on how they needed to get one or wish they could live such a nice life to get pushed around in a stroller with a fan. He is mildly spoiled huh? Once Daddy came back it was time to head for ice cream! Another must-have while in St. Augustine is Kilwin’s. Especially following such yummy pizza (it’s funny looking back at last year and seeing that we did the SAME thing haha). We were killin’ for some Kilwin’s for sure 😉 We let Kye pick out what kind of ice cream he wanted and I thought it was hilarious that he picked Superman. Does EVERY kid pick Superman or whhhhhat?!?! Another great benefit of a toddler, he can feed himself so we can eat and not have ours melt! Kye’s favorite thing about the hotel room was “making forks” He still asks us to do this all the time at home. Zach stacked ALL the pillows and let Kye hide (with his “friends” of course) in the middle of the stack. Kye thought it was hilarious and would hide then jump out at us and then he’d destroy the thing by jumping all over it. At least he got some last minute energy out before bed!!! It was one FULL but fun Saturday for sure! Ah, Florida. Wonderful place. Cheryl and I married and had our first two kids there. Glad you guys are having a great trip. Sounds like a full, fun day! The pizza looks fantastic! Looks like you guys had a ton of fun!!! 🙂 Side note, WHERE did you get that dress??? I love it!